As with many types of mass produced furniture, cedar chests can range in value rather widely. You may need to do a routine search on the internet for your piece in order to determine an appropriate value. Sites such as eBay can be helpful. This is a guide about finding the value of a Lane cedar chest. I have a Lane cedar chest that belonged to my mother. Two numbers are marked #481073 (I think) and the serial number is #735260. The outside condition would be considered poor, but the inside is in very good condition and still smells very good. What is the item valued at? Yours would be at the low end. They range from $99 to $700, with the majority between $200-$400. You have (to me) an unusual lane piece. I don't think I have seen one with the lovely legs like yours has! There is NOT an exact match to yours on eBay either in current or sold so I can't give you a value today. The market changes daily, so may find an EXACT match tomorrow or next week. Exact matches are critical to valuing items because some Lane's have almost no value, and some have held their value. If you compare yours to a one that is not identical, you could end up miss-valuing your piece and getting too little or having it sit for sale for months with no lookers. I recommend checking eBay or Google for the furniture auction houses to find examples of SOLD ones to get your exact value. When have sold these pieces I have never used the numbers...most people want to know wood, size, and type (like blanket or trunk) and leg style. It looks like yours are spool legs or maybe sheraton, but it is an odd angle, so I am not 100% positive. If you are looking for a quick sale for your piece...most of the plain chests sell for an average of 300-400 dollars. If you try to sell on Facebook, Next Door etc. you can start at these values, but you will need to drop them to sell. Been there, done that. You an also take good photos to an antique dealer and see what he/she will give you...that is easier than trying to sell it online (in any fashion). Good luck! It is a truly lovely piece! I wish I had room for it! Well - looking at the condition of the outside of your chest I would tend to think it would only be of interest to someone that wanted (or desperately needed) a storage place for blankets/quilts. It is for sure your chest would have to be bought by someone who intended to refinished it (and the veneer is a wreck on the bottom piece) or planned to keep it covered (hidden from view) or had a basement where it could be used. Don't get me wrong - there are people out there looking for pieces to refinish but they generally want a real bargain and no shipping costs. That generally means it would have to be listed in your area to sell. 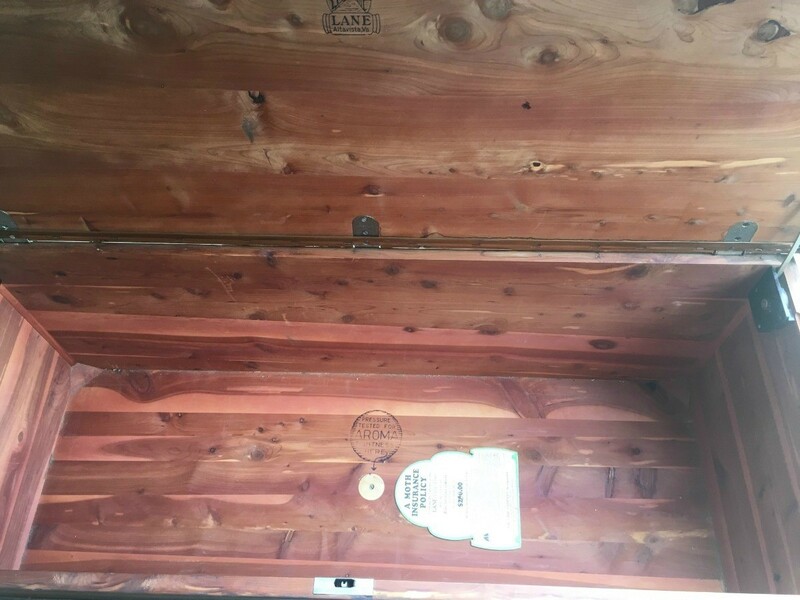 This is what I have found about dating a Lane cedar chest but your numbers do not correspond to this explanation but it is possible your chest is older and the numbering system was changed. Does your chest actually have Lane markings or does this happen to be what your mother remembers? Could it be another brand? I'm not sure this is the only way to date the chest so I'm just asking. 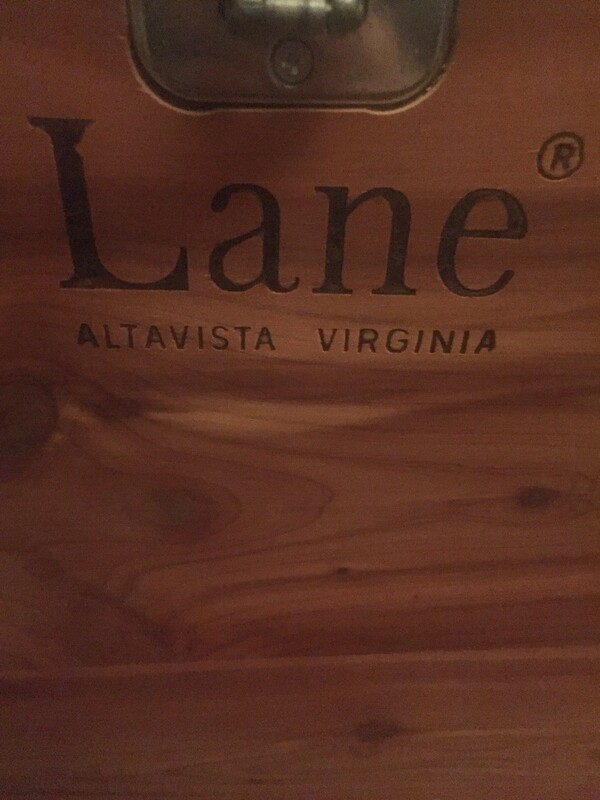 "All Lane cedar chests have a serial number. It doubles as the manufacturing date the chest was made when you read the number from right to left or backward. This means a chest generally has a five- or six-digit number that tells the month, day and two-digit year it was built. A chest built on April 1, 1940, would read from left to right 04140. Chests manufactured on two-digit days and in two-digit months generally have at least six digits. If the serial number has seven digits, the first number in the series is the plant number." It looks like your chest may be from the 1929-1930 circa - at least it looks like one in this ad. 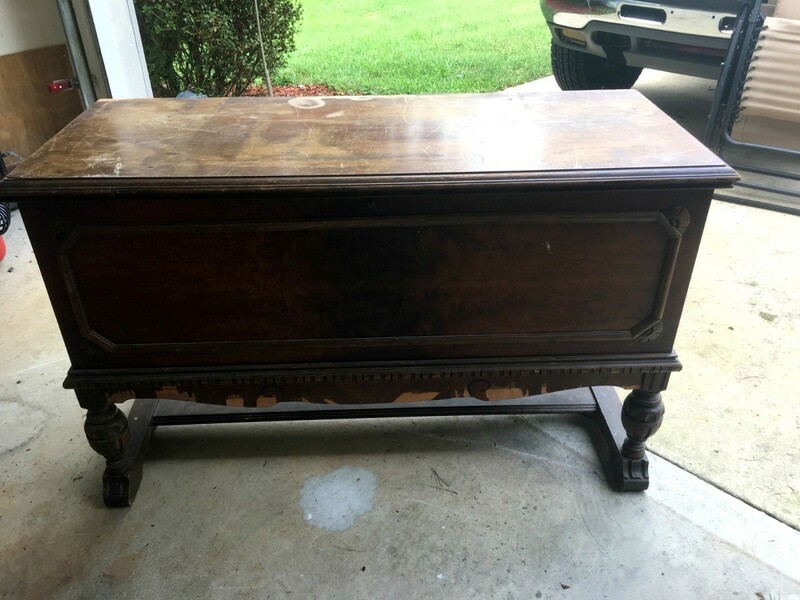 Here is one listing that claims chest to be from the 1920's (not sure about that) and you can see a similar leg style so I do believe these were the styles from that era. I do know that styles changed in the 1930's and started leaning toward the "art deco" styles. Then you run across a totally weird listing like this that does not make any sense except that the seller wants someone to haul the chest away. This is a pick up only listing. They say the same thing as you "good condition inside". I believe you can check eBay or other sites for Lane listings and most chests will be in good to excellent condition. It will be rare to find one in the condition as yours and that is what some value is based on. Other things that effect value is the year made and area located. Based on all of this, I think you should ask for an appraisal so that you will know for sure what the condition might mean to value. This could also tell you the age. Here is a link that has some free appraisal sites so why not spend a little time and get the information you need. You will need more pictures (lighter ones) that show detail of condition and style of legs as well as pictures of any and all marks/numbers anywhere in the chest. Appraisals give you a value for insurance but that is a starting point. 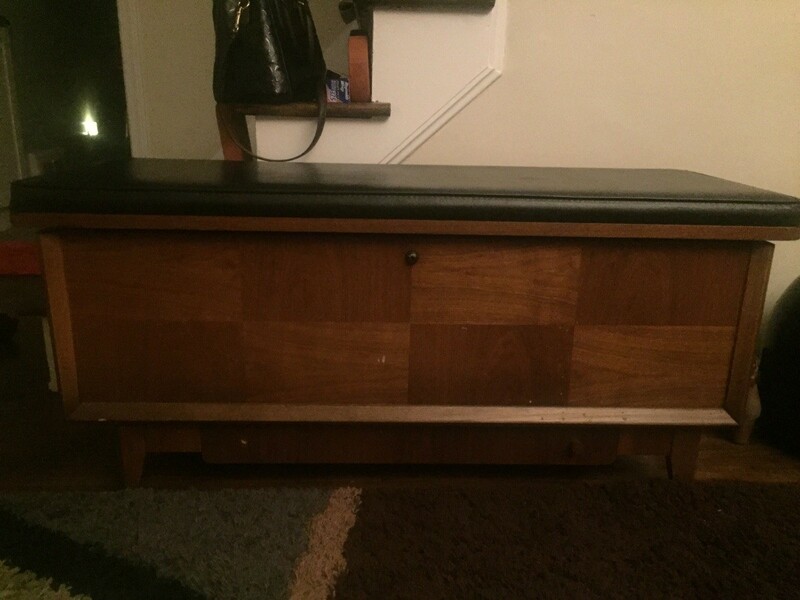 I have a Lane cedar chest. I am looking for any information you may have on it. It is in great shape. Asking prices on eBay range from $250 to $375 for chests like this. I believe your chest is one of the unusual ones and may need to be appraised to learn the true present value. I have been unable to find any chest remotely resembling yours. Your chest was made during the period the self-locking locks were used so If your chest still has the old style lock it should be replaced. Lane still offers free locks through this address. Serial number 2275110 - production date: 01/15/72. You start on the right and read to the left but you drop the last 2 as it is the plant number. "Some chests may also have an extra digit which denotes the plant location. That said; it seems easy to remedy that problem so due to these circumstances, locks are not considered a detriment to value (Lane appraisal). Your picture is very dark but it looks like you have cushion seat and also a drawer (?) at the bottom. What type of material is the cushion made of? Is it in very good condition? What about the overall condition of the chest? Does it have any bad issues/scratches/marks? Does the chest have a drawer or is it plain inside? All of this information will be necessary for someone (even an expert) to be able to give you a good appraisal. Very good pictures will make a big difference. Be sure the pictures are not this dark and take several pictures at all angles and be sure to take photos of all tags/markings (serial & style numbers) and show any damage places. You can ask for free appraisals (some are very good but you will learn something from everyone you ask) ask on several sites (not just one). I have been told that Lane does answer emails so you might want to ask your question here first. Here is another link to check out: You must follow their instructions when asking for information. Barneby's also does great appraisals but they charge $17. 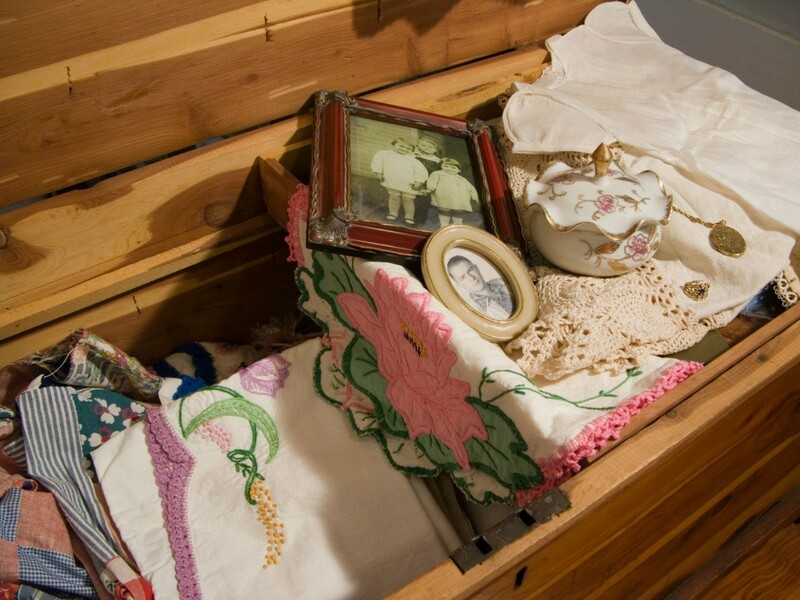 Good luck and we would like to know more about your cedar chest so let us know what you find out. 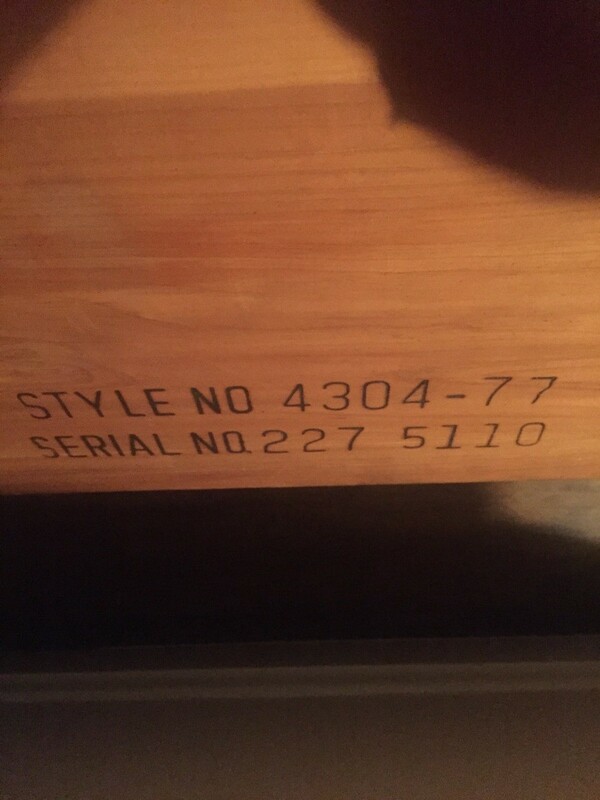 I have a Lane Cedar Chest with serial number 455110. It is in almost new condition, with original key, and finish. I am trying to find out the value of the chest for estate purposes. Most of the chests are worth between $200 and $400. I would price yours on the higher end.